What's it like to wake up the day after you planned to die? Colin Campbell was scheduled to die on Thursday 15 June 2017. He was due to travel to an assisted death clinic in Switzerland and end his life after 56 years. But an encounter with a stranger led him to postpone his appointment and give life another go. "I was quite surprised to wake up on the Friday," he says. "The Thursday morning was unusual as I had publicly declared it would be the day of my death and I'd been so prepared I'd be gone, but I'm still here." 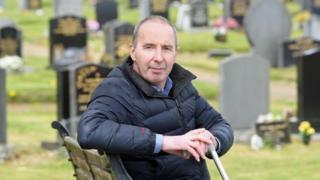 Colin, from Inverness, had reached his decision having been diagnosed with multiple sclerosis (MS) in 1995 after he started to find it more difficult to take part in sport. The condition attacks the nervous system, and although it's not terminal it is progressive. While he waited out the final few months, Colin took part in a television programme for STV about legalising assisted voluntary suicide. Rona Tynan happened to have the TV on that night and stepped into his story. "I heard the words 'multiple sclerosis' and 'Inverness'," she says. "So I dashed to the telly in my wheelchair and listened to Colin's story. I felt desperate that he was feeling he had to take this action." Rona was from the same city and also has MS. It has impaired the movement in her left side and started to weaken her right side too. A wife and mother, she says she has an active and happy life, although a year ago she had felt similarly hopeless. Colin and Rona join the BBC Ouch team in the studio for an emotional conversation about how a person comes to contemplate assisted death, the available support and controversial stem cell treatment. Also on the programme is journalist and anti-assisted suicide campaigner Mik Scarlet, comedian and mental health campaigner Juliette Burton and comedian Tom Skelton. Listen to the To Switzerland - Or Not podcast here. "Sometimes you think you haven't got a lot going for you, but I feel fresh air, people and friends would make a big difference in Colin's life." "I have spent thousands on things like stair lifts and private care but still haven't got a ramp. If these things were given to us, or proper help given earlier, I think life would be a lot easier." NHS Highland says it provides every MS patient with a specialist nurse to inform them about the support available and in Colin's case continues to work with him "to provide support and advice". "I just think it's very sad that this man went out to Switzerland not knowing the simple things," she says. Colin is more sanguine. He says when he visited the clinic in Basel, Switzerland, he had to pass six tests to ensure he was not vulnerable or being coerced. "If I'd failed any of those stages they would have denied to provide the prescription that enabled assisted voluntary suicide," he says. "You don't just think 'I'm going to kill myself'. If you decide to go to Switzerland, there's a lot of planning and it was a well-thought out decision." However, he admits the clinic did not ensure he had exhausted every avenue of support available. Journalist Mik Scarlet, a member of Not Dead Yet UK, a group of disabled people who oppose assisted suicide, says implementing a safeguarding level would be essential if it was legalised in the UK. Paralysed at the age of 15, Mik tried to take his own life two years later. "You can't say you've made an informed decision if you don't know about scooters or care plans." On Colin's initiative, he and Rona started to explore treatment options and Rona has travelled to Mexico to take part in stem cell research. The risky therapy involves wiping out the person's immune system with strong cancer drugs and then rebooting it with a stem cell transplant to stunt the progress of MS. In a recent study, out of the 281 people who had the treatment, nearly half benefited, but eight died shortly afterwards. Recovery can take as long as two years and it came with a £50,000 price tag which Rona had to crowdfund. While Rona recovers in Mexico from the treatment, Colin has settled into a new life and new ground-floor flat in Greenock, nearly 200 miles (322km) from Inverness. Despite the long-distance relocation, he says: "It's great. I get all my meals and essentials done for me". But his mind continues to return to winter and whether he wants to endure it again. "It's not pleasant. With MS you're at high risk of a chest infection. You develop a cough which then becomes pneumonia and its the pneumonia that kills you. "I was fully expecting that Thursday would be my final morning on planet earth. This is bonus time, but I'm realistic about it, my plans aren't cancelled."